The chief reasons for wearing a motorcycle helmet are to ensure motorcycle safety and motorcycle enjoyment. Despite controversy about whether or not helmets actually keep a rider from getting into accidents, recent studies in the United States and other regions of the world indicate that riders wearing helmets crash less often and incur few injuries and deaths in the event of a crash. Motorcyclists that sport helmets are less likely to suffer long-term or permanent disablement due to head or neck injury. Choose a DOT approved motorcycle helmet as it guarantees significant crash protection. In addition to basic motorcycle helmet safety, riders wear motorcycle helmets to reduce ambient wind noise. Wind brings about fatigue and distracts a rider. Motorcycle helmets also protect eyes from the wind and sun. A full face motorcycle helmet accounts for insects as well. Wearing a brightly colored helmet such as a pink motorcycle helmet, an orange motorcycle helmet or a purple motorcycle helmet allows other drivers to clearly spot you and your trajectory on the road. 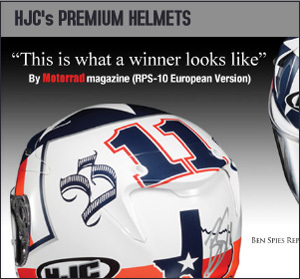 See our "Choosing a Helmet" section to find a helmet that is perfectly suited to your motorcycling needs.